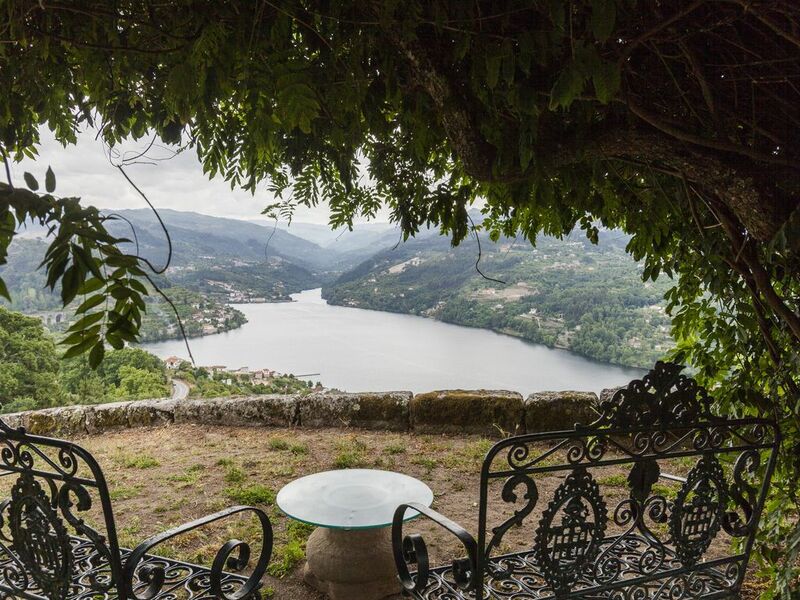 17th Century farmhouse set in 10 hectares of gardens, vineyards and orchards, with superb views over the Douro River. The approach is on a lovely winding track through the grounds. The property, with its orange, lemon and olive groves, has been in our family for several generations. The many prints, sketches and photographs lining the walls tell their own history of this Port wine region of Portugal. The property is 70km from the coast and Porto (home of the Port wine cellars and with its town centre designated as a Unesco World Heritage Site). You will enjoy total privacy in a fully modernised house but still with its unique atmosphere, overlooking the most magnificent views. All rooms have small verandas with superb river views and there's a Lounge with large fireplace. Large swimming pool (10m x 5m) with barbecue area and garden furniture. "We had a wonderful holiday at the Quinta which more than lived up to our expectations. The house is lovely, the views amazing and Francisco (the owner) is very pleasant and always helpful. The facilities and furnishings of the house are first class and contribute to the long history of the house. Our young children (6 yrs + 3 yrs) loved exploring the extensive grounds and swimming in the pool. I would unreservedly recommend this property for a relaxing stay in rural Portugal." The nearest international airport is Porto (75km, 1.5 hour drive). Direct flights with RyanAir from Stansted, Liverpool, Dublin, Paris and Frankfurt. Also BA, TAP, AirFrance, Lufthansa, AirBerlin. By previous arrangement we can organize transfer from/to the airport at extra cost, in a flexible way including stop in supermarket in the way to our house. A car is essential during your stay. Hire is available at the airport (best to book when booking flight) or through local agent near our house, if you prefer to use our transfer service from/to the airport. A unique chance to enjoy this unspoilt region of Portugal and discover the environment in which port wine has been produced for centuries, from the unique atmosphere of our Quinta, where you can pick your own oranges for fresh juice every morning, together with fresh bread delivered daily. The estate is ideal for artists, families or groups of friends, with its combination of total privacy, many local attractions, superb views and vicinity to the historic city of Porto, the Port Wine producing estates and the Foz Coa archaeological site – all 3 classified as Unesco world heritage sites. For your comfort we can organize at extra cost transfer from/to airport and tailor-made tours, so that you get to know the best of our beloved valley and its many attractions. Also possible are walking tours, fishing, river cruises, golf – or just staying by the pool gazing at the view. preços decrescentes em função da duração da estadia. preços dependentes do número de pessoas.